If you want to track your weight and integrate this data into your burgeoning collection of activity and workout data, you can manually add weight readings to most apps that store such data. But if you want a quicker way to do this, you might want to check out a Wi-Fi scale. They can automatically sync your weight, along with other data—such as your body fat percentage—to an app and/or website, keeping track of this data so you don’t have to. I’ve been using the Fitbit Aria for a couple of years and I recently got the Withings Smart Body Analyzer. Both of these scales work well but with some important differences. Here’s a look at these two scales. Both of these scales check your weight, and your entire family can use them—they can record data for up to eight users. The scales record and send data to its respective company’s server over your Wi-Fi network. You can then track your weight and other data on a website or using an iOS app. Accuracy is certainly an issue, but it’s best to assume that no scales are entirely precise and use them to simply follow a trend. The Fitbit scale is generally easy to setup, but I’ve had problems getting it to connect to my network, usually after changing batteries—once, the scale took more than an hour to work properly. This seems to be a common complaint amongst Aria users. The Withings scale was much easier to set up. Each scale also measures your body fat by sending a low electrical current through one foot and reading the current with a sensor under the other foot. The current passes through fat more slowly and the scale calculates the amount of resistance to come up with a body fat percentage. But body fat measurements are notoriously inaccurate, so you should take those numbers with a grain of salt. The Withings Smart Body Analyzer goes further, recording your heart rate, the temperature and carbon dioxide percentage in the room where the scale is stored (it takes readings every 30 minutes), and it can show the day’s weather. These extra gadgets are probably overkill; most people keep a scale in the bathroom, so the temperature and carbon dioxide readings are of little use. But the weather is a nice touch; it gives you an idea of what kind of day is ahead. The Fitbit scale is 12.3 inches square. When you step on it, you’ll see the weight number go up and down as it calculates your weight and as you change position. It won’t tell you if you’re not centered, and this scale often gives very different weight readings. For example, if I weigh myself before and after taking a shower, my weight is always less the second time, suggesting that either clean or damp feet make a difference in the way it calculates weight. If you weigh yourself several times in a row, you’ll get varying numbers. The Withings scale is a bit larger at 12.8 inches square, and for someone with big feet like myself, it’s a bit easier to use. It also has little arrows that light up at the corner of its display if you’re not centered; this helps ensure that you’re in the right position to get consistent readings. The Withings scale also has a larger, brighter display, making it much easier to read without my glasses. 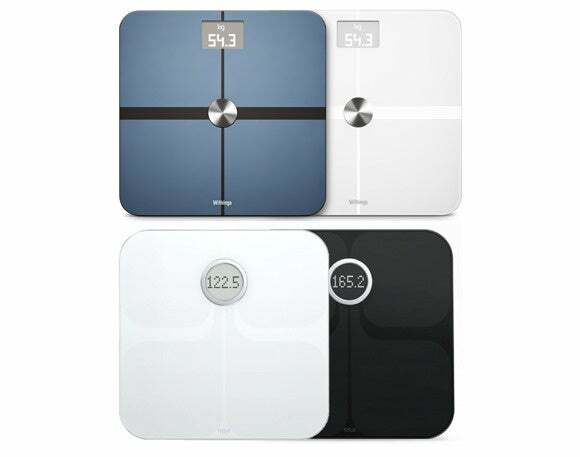 Compared to the Fitbit Aria, I weigh less on the Withings scale and my weight varies less from one weighing to another. But my body fat is lower on the Fitbit scale. Accuracy is certainly an issue, but it’s best to assume that no scales are entirely precise and use them to simply follow a trend. 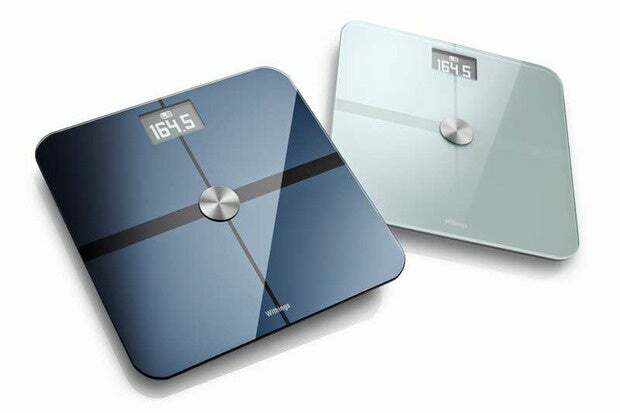 Choosing one of these scales depends on how you plan to use it. You simply want to record your weight: Either scale is good enough to record your weight, at least to keep track of its trend. But if all you want to do is see your weight, save some money and get a scale that doesn’t calculate body fat and doesn’t sync via Wi-Fi. Good scales like this cost less than $25. You’re wedded to the Fitbit or Withings ecosystem: If you’re already using a fitness tracker or other device made by one of these companies, then you’re more likely to want the scale that works best with that device, and whose data shows up in the same app. I’m not a fan of the Withings app, and Fitbit’s app offers more features, such as the ability to record the food you eat and calculate calories based on activity and meals. Withings, on the other hand, offers a wider range of devices, such as a blood pressure monitor, a sleep tracker, and more. You want your weight recorded in Apple’s Health app: If you use the Apple Health app on iOS—perhaps in conjunction with an Apple Watch—then the Fitbit scale is not for you. Fitbit’s app doesn’t sync with Apple’s HealthKit, whereas Withings’ does. So if using the Health app is essential, you’ll want to choose the Withings scale. Remember, you can manually add readings from any scale to either the Fitbit, Withings, or Apple apps. The real advantage of these Wi-Fi scales is convenience; you’re paying extra to save the step of manually entering data. 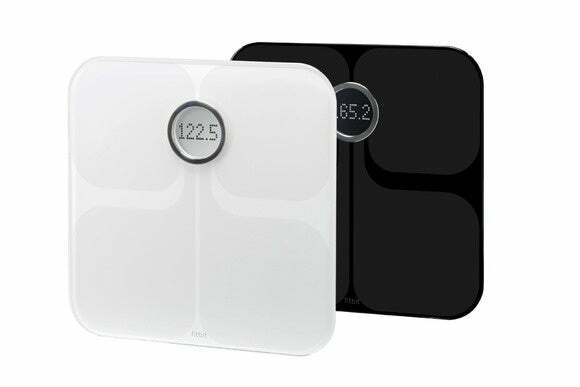 If you’re willing to spend more for that ease-of-use, then either of these scales works well.